Just a few weeks ago, IMCORP was performing its Factory Grade® assessment at a wind site in Canada. 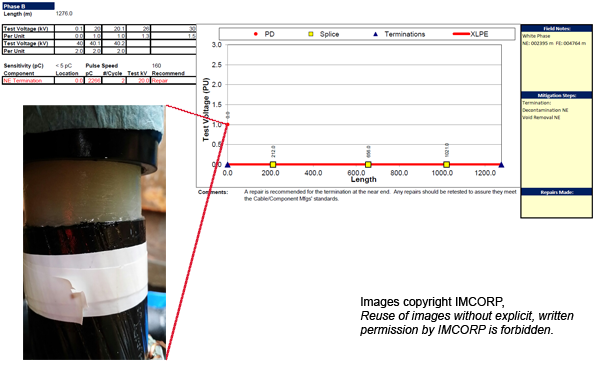 The assessment indicated substandard partial discharge (PD) at the near end termination. To determine the source of the PD, the assist crew was asked to remove the T-Body termination and the cable adapter. This picture shows multiple installation errors causing this termination to not meet the manufacturers’ standards. The semicon cut back (the most important part of a medium voltage termination) had jagged edges and the cable adapter position was half an inch off, resulting in the adapter not fully seating on the semicon cutback. This termination had PD activity at operating voltage. This means that during operation the PD would likely always be active, constantly discharging and eroding the cable insulation. Choosing IMCORP to perform the Factory Grade® assessment enabled this client to repair a termination defect that would likely not survive its design life. This termination was part of the ‘homerun’ circuit at this wind farm. If it failed, this could have been a $100,000 loss in revenue and repairs.